For the last 12 months a Club sub committee has been working on a proposal seeking to secure funds to enable the Club to purchase a number of keelboats. This proposal came a very big step closer to reality this week when the Northern Territory Government announced a grant for $240,000 as a co-payment to the club for this project. So what do we mean by keelboats and what do we intend to do with them? The keelboat committee created a list of criteria that we aimed to fulfill. We looked for a boat that was fast and exciting enough to be used for match racing and teams racing, a boat stable enough to be used as a training platform for those interested in learning to sail on boats other than dinghies and a boat that we could use to develop youth teams racing and woman's racing teams. We also recognised that there is a commercial opportunity with larger boats to offer team building and corporate sailing for community groups. The club has recently had several inquiries from large groups looking to get out on the water. They could be made available to members for charter for the wet season series and will provide a steady stream of keelboat crew to help revitalise our existing big boat fleets. The Elliot offers a fully open cockpit maximising space for crew work and training, can be rigged for symetric or asymetric spinnakers, has a lifting keel for draft access but through-hull rudder for better protection. 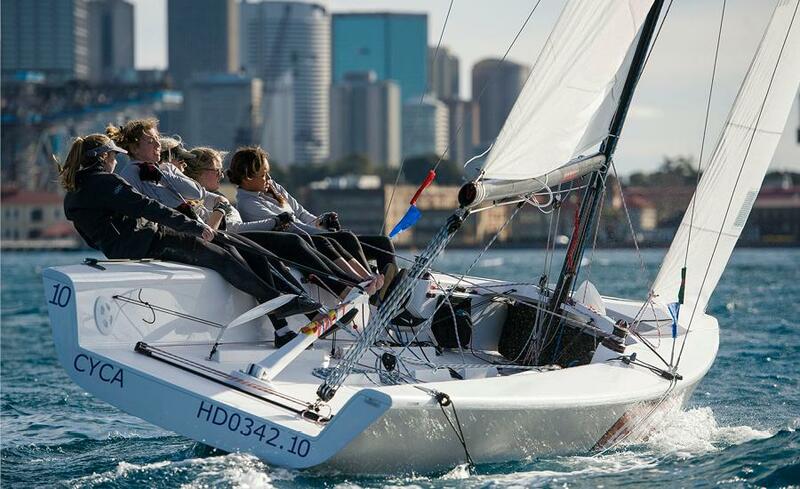 They are also the boat of choice for most Australian match racing competitions. But enough words, check them out yourself at Elliott Marine. The boats are made in China by McConachy yachts (builder of Wild Oats) with an anticipated delivery of 6 months from the time of order. Where possible, local businesses will be used to supply as much of the additional hardware as possible. A key factor in receiving the funding was a commitment to host National and International match racing events. The aim is to run a flagship North Australian Championship targeting match racing sailors currently competing at events worldwide. There is also the opportunity to run a Corinthian event where competitors come match racing as part of a social week of sailing with tourist activities very much part of the event. This would particularly appeal to visitors from the Asia Pacific region. At the same time, we will be putting a youth match racing team together to compete at one of the premier events held down South towards the end of the year, developing skills to bring back to the club that can be invested in a local program once the new Elliotts arrive. So as you can see, there is a lot more involved than simply buying a few new boats. It's an ambitious program that has the potential to be a game changer for the Club. With your assistance it will be a fantastic resource that all members will get benefit from. More updates to follow as information comes to hand.